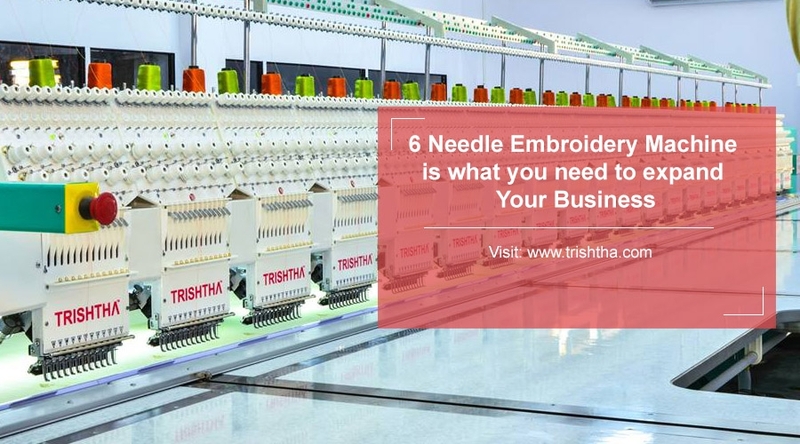 6 Needle Embroidery Machine Is What You Need To Expand Your Business - Trishtha Industries Pvt. Ltd.
6 Needle Embroidery Machine is what you need to expand Your Business! Embroidery is proving to be a very lucrative business, especially for stay-at-home mothers and hobbyists. If you already have a home-based business and thinking of increasing production of embroidered garments, turn to Trishtha. We have a wide range of robust and hardwearing 6 needle embroidery machine that you can include in your embroidery equipment arsenal. The switch from single-needle to a multi-needle machine is going to help widen your embroidery capabilities. Intricate and minute designs featuring sundry colors will no longer be a problem for you to achieve thanks to our multi-needle machines. Each of the 6 needles of our machines is able to hold threads in different colors so that you can finish colorful and stunning appliqués in no time. At Trishtha, we specialize in supplying 6 needle machines, which are computerized embroidery machine. Since our machines are computerized, they do not require any human interference to function. All you have to do is upload the design that you want embroidered and leave the rest to our machines. Fashion-forward men and women today are constantly looking for garments and accessories that have a wow factor. Gone are the days when people would be happy with a bit of embroidery work on the front of a garment. Today, the more futuristic a design is, the more is its demand. With our 6 needle embroidery machine, you will be capable of quickly embroidering both the back and the front of garments without any hassle. Join hands with Trishtha today to take your embroidery business to the next level. Check out our range of computerized embroidery machine to place your order.